Welcome to Day 6 of Crafty October 2014 (check out 2013 and 2012 here) – a month of Halloween Ideas here on The Purple Pumpkin Blog! Autumn and Winter is the time of year that I do a lot more cooking using a slow cooker. There is something really comforting about smelling the food cooking throughout the day (I work from home), and I love that you can literally just throw everything into the pot, turn it on and then not have to worry about it all day long. So today I’ve got a recipe for a delicious Spicy Pumpkin and Butter Bean Soup. 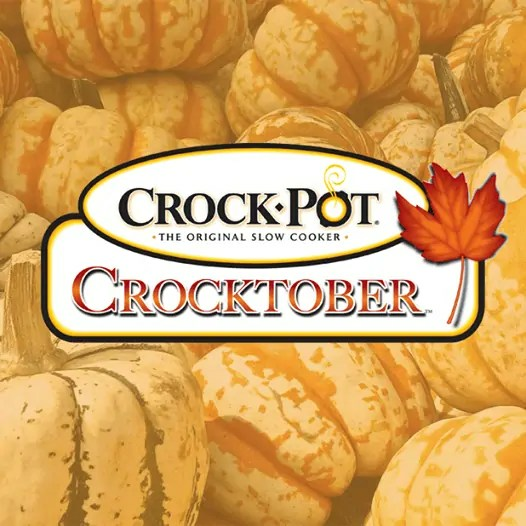 Not only is October #CraftyOctober for me on my blog, it is also Crocktober organised by the original makers of the slow cooker – Crock-Pot. They asked some of their favourite bloggers to contribute some slow cooker recipes, and since I love cooking with mine, I said yes immediately when they asked me! Check out the #Crocktober Link Party at the bottom of this post, where you can share your favourite slow cooker recipes! I was sent a 4.7L digital Crock-Pot to use, which felt very space age! I’ve never had a timer on a slow cooker before – I just turn it on and leave it! What I loved about the digital one was that after the time has run out, it sets itself to warm, so you don’t have to worry about overcooking. Although, I’ve never worried about that – I’ve cooked some things for nearly 24 hours before!! 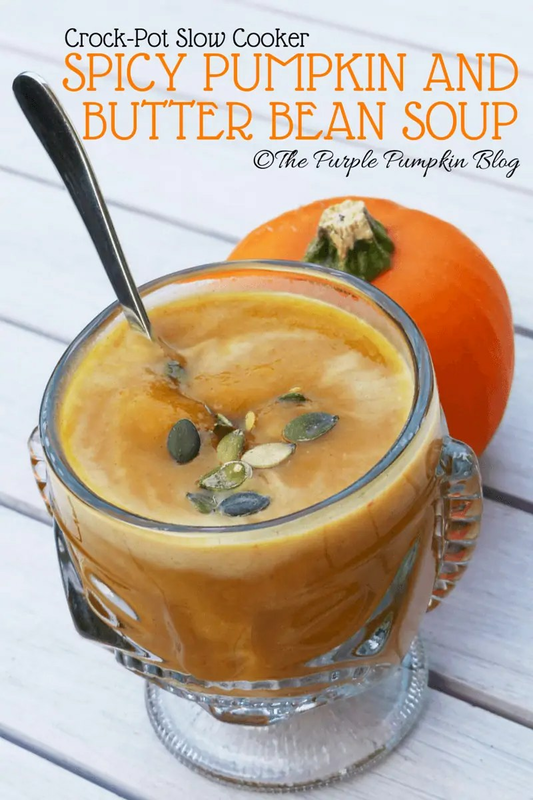 Since this soup contains pumpkins, and October is a month of pumpkins as far as I’m concerned, it felt good to share this recipe as part of Crafty October too. I have never made soup in a slow cooker before, so this was new territory for me. I have to say that it turned out brilliantly – and tasty too – and making soup in the slow cooker is so easy, I’m going to do it that way all the time from now on! Generally, when I cook in a slow cooker, I don’t measure much and just guess as I go along, some of my recipes are a bit more precise, like my Hawaiian Pulled Pork. I like to keep things as simple as I can when it comes to the recipes I make up, and I think that this soup recipe is one of those! You can adjust the various spices to your own tastes. We like things a bit hot in this house, but you can dial it down if you need to. I used a medium sized pumpkin, which gave around a kilogram of flesh after peeling and deseeding. If you can’t find pumpkin yet, you could use butternut squash instead. You could also substitute the dried chilli flakes for fresh chilli. To keep this dish vegetarian, I used vegetable stock, but you could also use chicken stock for added flavour. I treated making soup in the Crock-Pot the same as I would in a pan, once the veggies were cooked, I blitzed with an hand-held immersion blender, and then seasoned if needed, with salt and black pepper. I was then able to add the butter beans before the final bit of slow cooking. I served the spicy pumpkin soup with some milk drizzled on top (you could use cream for added decadence!) and some toasted pumpkin seeds. This soup was a mouthful of flavour and texture! Turn your slow cooker to high. Place all of the prepared vegetables and garlic into the pot. Sprinkle over the chilli flakes and spices and give everything a toss with a large spoon to coat everything. Cook for 4 hours and after this time, puree in the pot with a hand-held immersion blender. Taste and season with salt and freshly ground black pepper if you wish. Stir in the butter beans and cook for a further hour. To serve, pour into bowls, drizzle with a little milk or cream and sprinkle with the pumpkin seeds. 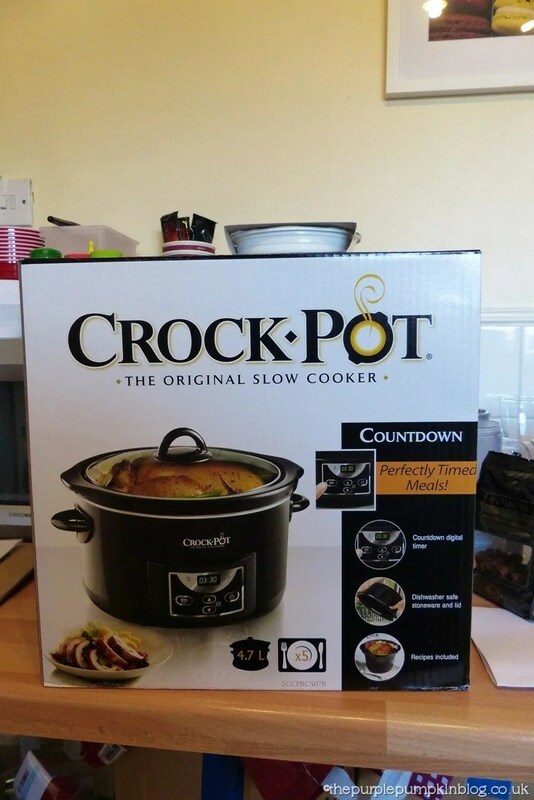 Disclosure: I was sent a Crock-Pot Slow Cooker to develop recipes. This soup looks and sounds delicious. I love beans and pumpkin, it sounds very filling and winter warming. I’ll have to try it soon. Oh, what a great way to use up squashes. Can’t wait to try this. It looks delicious! I love making soup and this one looks delicious ! I am going to try it tomorrow! Looks & sounds yummy. 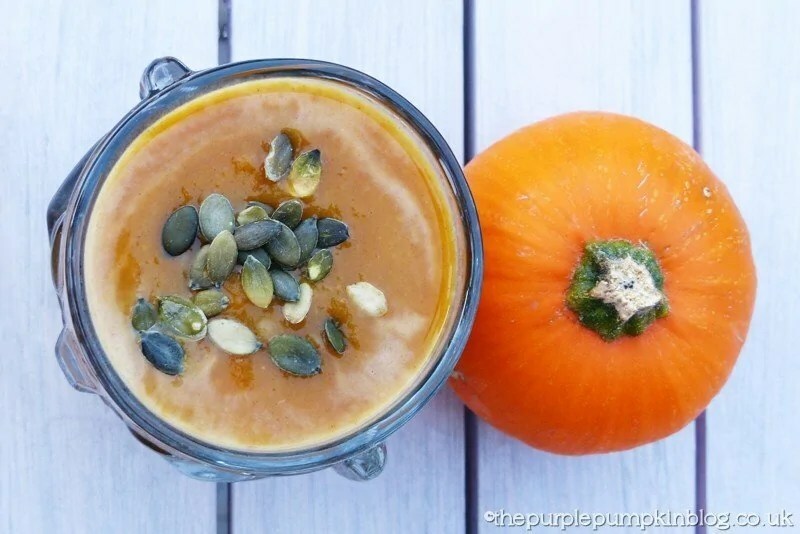 I love cooking with pumpkins this time of year and soup is the perfect warming food! this sounds like my kind of soup, and perfect for this time of year with a warming bit of spice to it. I think I’ll try it instead of my usual sweet potato and parsnip. Will cook it in a pressure cooker though, should work ok I think! This is so perfect! Ive been obsessed with pumpkin ever since Halloween. Cant get enough of it so this recipe will be great! Being vegeterian and a huge fan of the very underused ingredient of pumpkin this particular receipe would be my ultimate choice to try out if and when i ever get a slow cooker. Tried the Spicy Pumpkin and Butter Bean Soup (unfortunately without a slow cooker as I don’t have one) but still delicious. Just love soups at this time of the year! Glad to hear it worked out just as well without a slow cooker! The soup sounds delicious and is absolutely perfect for this time of year – I’ll definitely be giving it a try. This sounds so delicious, now the weather has started to turn and the evenings are getting darker earlier this is just the kind of confort food I’m looking to make – will have to give it a go! Very seasonal, and we have all the ingredients too! Yum. Love pumpkin flavoured stuff. Your glass it is in is awesome as well! Thanks! I love that glass, it’s a Tiki one from Walt Disney World!! This sounds lovely, thank you. It was! Making it again on Friday! This so look’s so tasty and has butter beans in – my husband and son would both love this! Hope they enjoy it when/if you make it! It’s worth making – it is so delish! I definitely will, thank you! Pumpkin and butter beans – two of my favorite things – this should be an incredible soup! It really was – I loved how it turned out! I’m always on the hunt for pumpkin soup recipes! What a great autumn recipe. 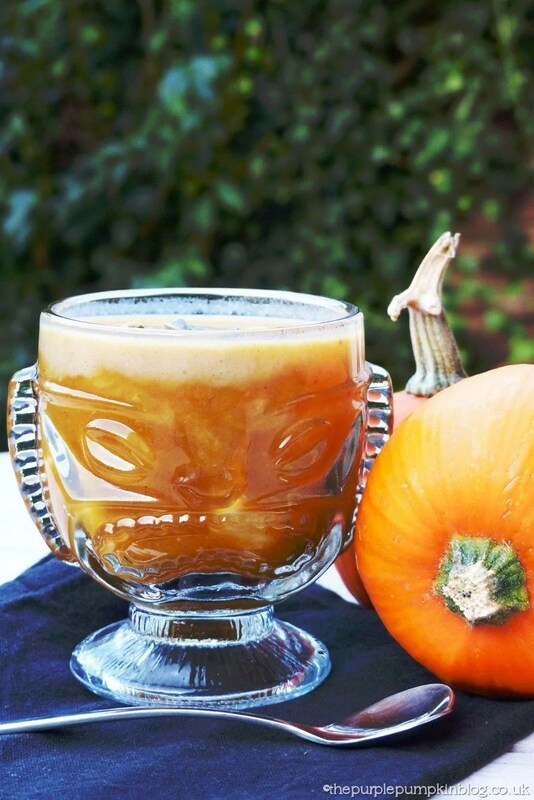 Pumpkin is the quintessential autumn ingredient! Sounds delicious and very timely too, what with having an upcoming bowl of pumpkin to find a use for! Perfect timing! Hope you enjoy it! Oh may have to try this…got myself a slow cooker and have used it all of once! !